Warangal which is also known as 'Orugallu' or 'Ekashila Nagaram' is a city in Warnagal district in Andhra pradesh. It was the capital of Kakatiya kindom. It is famous for sculpture in Thousand pillar temple and Ramappa temple. Fortunately, i got a chance to visit warangal recently which was a pleasant experience. We could see only Ramappa temple due to time constraint :( . Anyway i heard that government is reconstructing thousand pillar temple and construction was not complete yet. 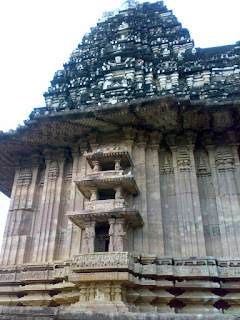 Ramappa temple situated at Palampet village is very old Ramalingeshwara temple dating back to 1213. It displays the culture of Kakathiya kingdom with finest architecture. The enormous Nandi before the temple is excellent still. The sculpted figures on pillars and ceiling are finely chiselled. There is a Lake near the temple. We enjoyed boating there and the scenery was excellent.